Home Cryptocurrency Bitcoin Versus Ethereum : Has ETH Lost The Battle For Good? Bitcoin [BTC] Versus Ethereum [ETH]: Has ETH Lost The Battle For Good? The Bitcoin blockchain versus Ethereum blockchain used to be the favorite debate in the crypto community. That was before the so-called “Ethereum Killers” came on the scene to battle ethereum as the platform for launching Decentralized applications (DApps) and smart contracts. Bitcoin dominance level has reached 58 percent and may reach two-thirds of the entire crypto market if the bear market drags further. In times of uncertainty, investors tend to take their investments into established assets like bitcoin [BTC]. This, however, has not been the case with Ethereum, the second biggest cryptocurrency by market capitalization. Instead of investors flocking to ETH, ICOs have been liquidating their ETH holdings causing the ETH prices to drop and its market share to diminish to12.62%. Put in perspective, ethereum had a market dominance of about 30%to bitcoins 38% in June of last year. Current BTC and ETH prices are a long road from the highs of December and January respectively. At $6,238, BTC is down 55% since the start of the year and 68% since its all-time high (ATH) of $19,600 in December. Compared with BTC, ETH has fared a lot worse. The token has shed about 85% of its price since from its ATH of 1,400 in January, currently trading at a yearly low around $172, down 11% in the last 24 hours. 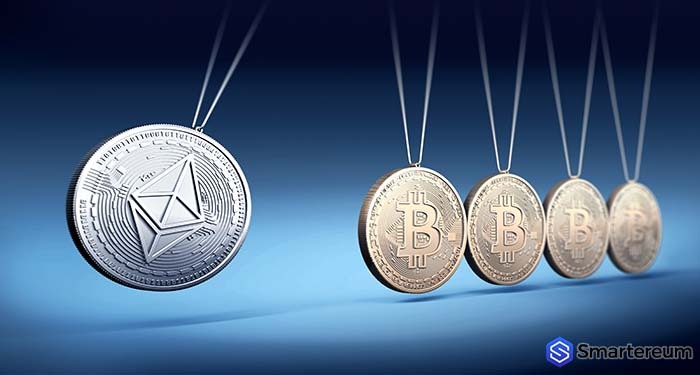 Once the go-to platform for launching DApps and deploying smart contracts, Ethereum is facing stiff competition from newer blockchain networks which position themselves as better alternatives to ethereum. Projects like EOS [EOS] Cardano [ADA], Tron [TRX], IOTA [MIOTA] amongst others are working on providing better, faster and more efficient platforms to deploy DApps. They are also providing incentives for developers to create and deploy DApps on their networks. At 0.027 the ETH/BTC pair is the lowest it has been since March 2017. At this point, one may ask, Will they be more blood before a recovery? Will there be a recovery? Previous articleAt what price will Ethereum [ETH] end 2018: Will ETH Ever Bounce Back?